As a student at the Royal College of Music in the 1960s, I took part in a performance of the American Randall Thompson’s short choral work, Alleluia. To be honest, I didn’t think very much of it at the time – a period when composers were experimenting with atonality, klangfarbenmelodie, aleatoricism, etc. – as this piece seemed to be predominantly diatonic, with few chromatic notes, and conventional modulations and suspensions, and with a text of only one word (two, if you include the final ‘amen’). 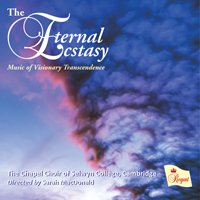 I’ve recently been listening to a beautiful new CD entitled The Eternal Ecstasy (http://www.regent-records.co.uk/product_details_307.htm) Performed by the excellent Chapel Choir of Selwyn College Cambridge, director Sarah MacDonald, and recorded in the warm acoustic of the Lady Chapel at Ely Cathedral, it is a selection of unaccompanied choral music by US and UK composers, mostly written in the last twenty years or so. In the sleeve-note, the producer Gary Cole makes a persuasive case for this particular selection of music – ‘music of visionary transcendence’, which he describes as ‘a musical style that transcended previous national schools and earth-bound identities…..visionary music that removes the listener from the temporal bounds of everyday petty concerns, and transports them to a place of spiritual calm, and of timeless certainty’. And he makes a claim for Thompson’s Alleluia (1940) – beautifully performed and shaped on this disc – as one of the first manifestations of this style. Re-listening to this piece several times, the juxtaposition of traditional harmonies and suspensions, within a varied and richly coloured choral texture, and where words are relatively unimportant, enables one to concentrate on the pure sound and be lifted, perhaps, to a different plane. To me, the essence of this timeless music is like a knitted, patterned pullover – it contains strands of different coloured wool (harmonies), which are knitted together and appear to combine with each other in different ways as the pullover is stretched in different directions, but never lose their basic qualities however much they are pulled apart and re-shaped. And since the 1980s, in particular, that stretching of triadic musical material has become a stylistic trait of much music from Eastern Europe and the Baltic States, as well as the music on this disc. Take Penderecki, for instance, and compare his colourful aleatoric music of the 1960s with his later works. Or, from this disc, take Tavener’s Hymn to the Mother of God (1985), with its achingly beautiful sustaining and overlapping of primary triads – a brave return to diatonicism compared with his atonal music of the 1960s. Not all the works on this disc are perhaps quite as consistently ‘transcendental’ as that (nor are they probably intended to be) – Cecilia McDowall vividly alternates a lively 6/8 with sonorous slow-moving chords in her Regina Caeli, my own The Spacious Firmament has some fast moving dramatic elements amongst the slow reflective and ‘timeless’ moments, and Paul Mealor contrasts a wide range of colourful textures and speeds within the four movements of his Now sleeps the crimson petal. But the majority of the works are indeed mainly quiet, slow moving, viewing largely diatonic material from different angles, perhaps like my stretchy old pullover, and the inward calmness that the act of knitting can create. But there is far more to them than the rippling streams of ‘mindfulness’ or of ‘music for meditation, relaxing, and healing’ beloved of gift shops – in all the pieces there is a grit, a logic, a sense of colour and detail that keeps the mind active as well as spiritually calmed. The title work, Philip Cooke’s The Eternal Ecstasy, certainly fulfils the ‘visionary’ brief, with a beautiful sense of mysticism in its response to Marcus Tomalin’s translation of St Teresa of Avila, and works by Eric Whitacre, James MacMillan, Iain Quinn, David Bednall, John Duggan all achieve, in their different ways, a captivating mood of quiet, reflective calm, with more to discover on each listening. Finally, the disc contains two classics of the genre: the American Morton Lauridsen’s O magnum mysterium – like Thompson’s Alleluia in a luminous D major, but with its diatonicism coloured by a poignant superimposition of primary triads, and the English William Harris’s Bring us, O Lord God – of the Randall Thompson generation, a beautiful, and forward-looking final flowering of the Edwardian choral tradition. It’s perhaps a rather obvious thing to say, but sometimes those of us who have spent much of our lives teaching and composing forget about the sheer power of music to communicate, to calm, to colour the listener’s mood, even to change lives. This disc reminds us of that. This entry was posted in Uncategorized and tagged Chapel Choir of Selwyn College Cambridge, Ely Cathedral, Gary Cole, Randall Thompson, Regent Records, Sarah MacDonald on July 27, 2015 by alanbullard.